As a result of bass player Robert Ryder's involvement in the Celebration of the Life of Philip Lynott Concert in Los Angeles, Rude Awakening was asked to perform at two seperate Philip Lynott Tribute Shows. The first, on January 3, 1996 was held at the National Club in Kilburn, London. Also playing at the event was The River Gods and Dizzy Lizzy. The concert was organized by John Meaney, a longtime Thin Lizzy fan. Also in attendance was Philomena Lynott and DJ Kid Jensen. It was truly a rockin' gig. There were Thin Lizzy fanatics literally kissing each other with glee! 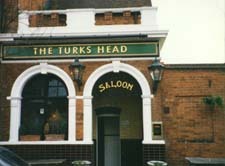 The band stayed at a pub in Twickenham called the Turk's Head. The owners, Chris and Sigrun Brazier-Kobus, were extremely gracious hosts and treated Rude Awakening to many an ale and meal. Only the finest. It was so cold in London during the time we were there, the news reported that the river Thames froze for the first time since World War II! 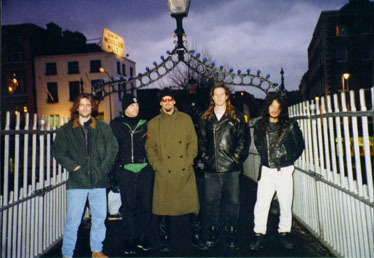 The next morning, January 4th, the band flew to Dublin, Ireland at the behest of Smiley Bolger, promoter extraordinaire. The concert was sold out and a smash event. It was held at the Temple Bar Music Center, a cool venue that is in the heart of Temple Bar, Dublin. Also playing were Limehouse Lizzy. Brian Downey came out and did a jam with some other notables from Phil's past. The party lasted on into the night. Reviews of us in the Irish Times said we stole the show. On January 5th, the band went to Philomena Lynott's house to see her and her household. She let us look at all of Phil's poetry and photo albums. 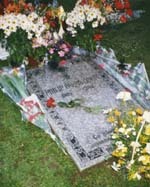 Also, she took us to the cemetary where he was buried and the church where his funeral service was held. She also showed us the site where the hotel Philip bought for her was before it burned down. The next night we played at Smiley's pub, Slattery's. On January 7th, we returned to Twickenham, and played a gig at the Turk's Head. On January 8th we played at a club in Kingston called the White Horse with a local act. Then we came home.